Since 1995, The Foam Factory has offered customers a wide range of top-quality latex foam mattresses and bedding products. Created using the Dunlop method of latex foam production, The Foam Factory’s latex contains only 100 percent natural ingredients, without any filler or synthetic material included in the formula. This natural makeup helps make all of their latex mattresses, latex mattress toppers, and other comfort accessories hypoallergenic, anti-microbial, and resistant to mold, mildew, and mites. Since its introduction, latex foam has become known as an excellent support and pressure relief product, excelling as bedding and comfort products. Soft enough to hug the contours of the body at rest, but also resilient enough to “spring” in support of areas that generate less pressure, latex foam is very versatile. The degree of resiliency this material provides also means that it requires no recovery time to respond to your new position as you move through the night, constantly providing support. One of the more popular recent trends in latex foam bedding is the layering method, where thinner latex foam sheets of varying firmness are stacked upon one another to create a custom, hybrid feel in a sleeping product, rather than limiting an individual to a single, solid piece of the foam. Companies like Sleep EZ and FloBed trumpet the benefits of this technique, as it offers totally individualized personalization. And while adding top comfort layers can boost the cushion of a mattress, and combining two different firmness types will create a feel a single material cannot produce on its own, differences in material more than 5 inches from the sleeping surface are generally not noticed. This is because of the natural firmness and resiliency of the latex foam material. Those same qualities also mean that if identical material types are used in thinner sections, no extra benefits are had over a solid section of the same material. 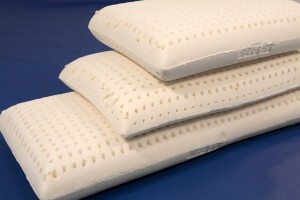 Sleep EZ offers mattresses with three or four available sections of 2.8 inch latex, each able to be personalized to one of their four firmness values. Personalization is a fantastic option for customers, but in the case of latex foam, these options don’t always equate to a meaningful difference in the end product. Many different mattresses can be made out of the numerous options available, but with a comfort range generally within 3 inches of the surface, and support performance extending to 5 or 6 inches, the top couple layers are the only ones impacting performance. Many of the possible combinations would be impractical as well. A mattress with three soft bottom layers and a firm top layer can be made, but wouldn’t have any functional benefit. Also, should a customer desire a mattress with three or four identical layers, the foam will still go through unnecessary cutting, where a solid mattress would have saved the cost of labor that is passed on to the customer. FloBeds feature a similar layering setup, with convoluted eggcrate as an option. Eggcrate provides excellent cushioning and comfort, but only when it is used atop the sleeping surface. 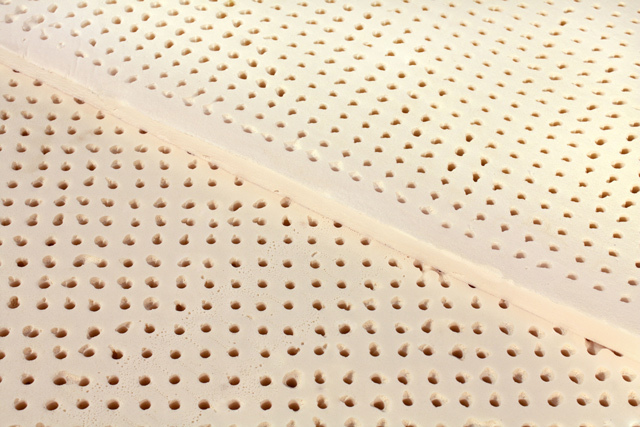 At the middle or bottom of a latex foam mattress, eggcrate’s comfort and pressure relieving characteristics are negated, and it only provides extra product height, which is also minimized because with less mass than an uncut full sheet, it is more easily compacted. The Foam Factory offers a solid, 6 inch all-natural mattress in either medium or firm feels. In addition, they also feature multiple customization options for creating personalized comfort for anyone. For combining layers, The Foam Factory has latex foam toppers in 1, 2, and 3 inch heights, in both soft and medium feels to provide a cushioning comfort layer. By keeping their base layers solid rather than a combination of layers, The Foam Factory saves customers superfluous cutting costs. Some companies offer comfort zones as another level of personalization, but the way it is done can affect how beneficial these zones actually are. 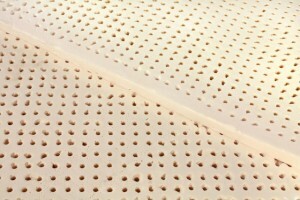 FloBeds takes horizontally cut latex strips and attaches them with Velcro. This leaves open the chance that, over time, the seams can weaken in their support or even come apart. Other companies use glue to bond their sections together, but that method occasionally draws complaints from customers who find the adhered seams are harder than the rest of the mattress. With the extra effort required to produce an eco-friendly mattress, latex foam often costs more than conventional foam varieties. Despite this, The Foam Factory’s prices are much lower than competitors, all while using the highest quality, 100 percent, all-natural Dunlop latex foam. Their queen-size, 6 inch organic mattress with medium firmness is priced at only $571.99. That mattress can be compared to the 7 inch Sleep EZ queen-size bed at $1,195 or a 100 percent natural latex Foam Sweet Foam queen-size mattress, consisting of two 3 inch layers in medium density, priced at $1,479. For a combination mattress with dual sleeping layers, a firm, 6 inch, queen-size The Foam Factory mattress at $581.99 plus a 2 inch soft mattress topper at $179.99 makes for a custom 8 inch mattress setup at $761.98. The comparable Sleep EZ mattress costs $1,395 for an 8.5 inch mattress while a 7 inch, all-Dunlop, dual-layered, queen-size Savvy Rest mattress is more than $3,000, with an included organic quilted case. When deciding what you want out of a new mattress, remember that latex foam is a long-lasting, resilient, supportive and comfortable natural mattress product that more and more people switch to every year. It’s important not to get caught up in all the fanfare about the material however. Luckily at The Foam Factory, you can get the quality you need at the right price.